FC Barcelona remain ahead of Real Madrid atop of the league standings following their 3-0 victory over Espanyol in the Derbi barceloní. Barça struggled in the first half and played to a goalless draw. 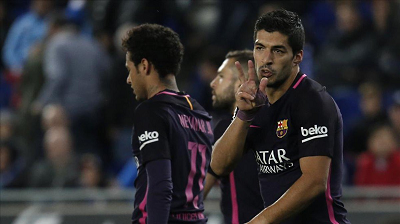 However, Suárez broke the deadlock after five minutes into the second half. Rakitic scored the club’s second goal in the 77th minute before Suárez grabbed his second goal of the evening three minutes before time. Next up for Barça will be a tough clash on Saturday when they host Villarreal. Espanyol: Diego López, Javi López, David López, Diego Reyes, Aarón, Javi Fuego (Marc Roca, 79′), Víctor Sánchez, Jurado, Piatti (Hernán Pérez, 66′), Gerard Moreno & Caicedo (Leo Baptistao, 61′). FC Barcelona: Ter Stegen, Sergi Roberto, Piqué, Umtiti, Jordi Alba, Rakitic, Busquets, André Gomes (Mascherano, 78′), Messi, Luis Suárez & Neymar. Cautions: Gerard Moreno (14′); Aarón (58′); Javi Fuego (68′). Previous PostBarça hammer Osasuna 7-1. Next PostBarça’s Upcoming Four Battles.